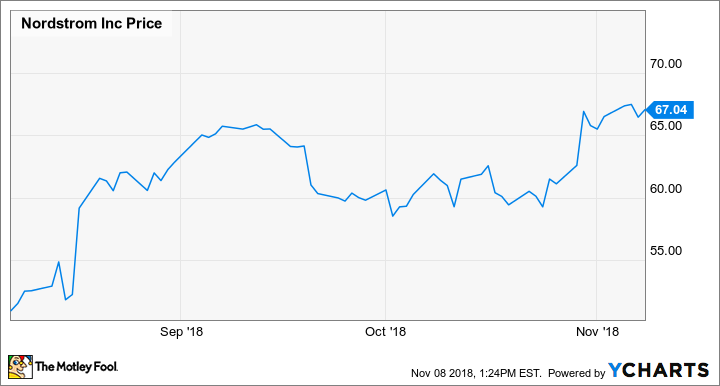 Earnings Preview: Can Nordstrom Maintain Its Momentum? Nordstrom stock has surged since the company's second-quarter earnings report. Can the retailer pull off another positive surprise next week? Shares of Nordstrom (NYSE:JWN) plunged in late 2015 and failed to regain any traction for nearly three years. It's no secret why. A slowdown in sales growth, combined with rising costs, caused adjusted earnings per share to slump from $3.72 in fiscal 2014 to $2.90 in fiscal 2017. However, Nordstrom is finally getting back on track. Investors applauded the upscale retailer's strong second-quarter earnings report, which was released in August. Indeed, Nordstrom shares have surged more than 30% over the past three months. Nordstrom Stock Performance, data by YCharts. Of course, that means expectations are high for Nordstrom's third fiscal quarter. Here are three things that investors should look for in the upcoming earnings report. Is Nordstrom's sales momentum continuing? Comparable-store sales rose 4% at Nordstrom in the second quarter of fiscal 2018, which was a big acceleration from the 0.6% increase it achieved in the first quarter and the 0.8% growth it logged for fiscal 2017 as a whole. Comp sales growth was equally strong for the full-line and off-price sides of the business during Q2. Nordstrom will face a relatively easy year-over-year sales comparison in the third quarter, as comp sales sank 0.9% in the year-ago period. On the other hand, Nordstrom's full-year outlook remains fairly cautious, calling for 1.5% to 2% comp sales growth, compared to the 2.4% comp sales gain it achieved in the first half of the year. Nordstrom's annual Anniversary Sale -- which tends to be a huge sales driver -- fell almost entirely in the second quarter this year. Without a major promotional event of that nature, comp sales growth probably moderated in the third quarter. Nevertheless, there's a good chance that Nordstrom's comp sales growth exceeded 2% last quarter. Nordstrom may be able to surpass its cautious fiscal 2018 comp sales forecast. Image source: Nordstrom. Will Nordstrom change its full-year earnings guidance? A new revenue-recognition accounting standard shifted some of Nordstrom's earnings from the third quarter to the second quarter this year. As a result, the company probably saw little, if any, earnings growth last quarter. Indeed, analysts on average expect EPS to come in at $0.65, down from $0.67 a year earlier. Still, if Nordstrom posted another solid comp sales increase in Q3, the company could be in position to raise its full-year EPS forecast for a second straight quarter. In conjunction with its second-quarter earnings report, Nordstrom raised its fiscal 2018 EPS guidance from a range of $3.35-$3.55 to a new range of $3.50-$3.65. The new guidance range works out to a 21% to 26% year-over-year EPS increase. If Nordstrom can reach or exceed the high end of that range, it would unlock further upside for the stock. Did share-repurchase activity heat up? At its investor day in July, Nordstrom projected that it would return $5 billion of cash to shareholders between 2018 and 2022, including $3.7 billion of share repurchases. That would be a huge increase in the pace of buybacks. Nordstrom bought back $277 million of stock in fiscal 2016, $211 million in fiscal 2017, and $82 million in the first half of fiscal 2018. As of the end of the second quarter, Nordstrom's cash balance was $424 million higher than it had been a year earlier. Thus, the company certainly had the means to buy back a lot of stock last quarter. Furthermore, the board approved a new $1.5 billion share-repurchase program in August. It will be interesting to see how aggressively Nordstrom ramped up its buyback activity in the third quarter. Higher share repurchases will add to Nordstrom's EPS momentum over time, while also providing a "buyer of last resort" for Nordstrom stock. Both factors could contribute to further share-price gains over the next few years.